The Dream came back the other night. 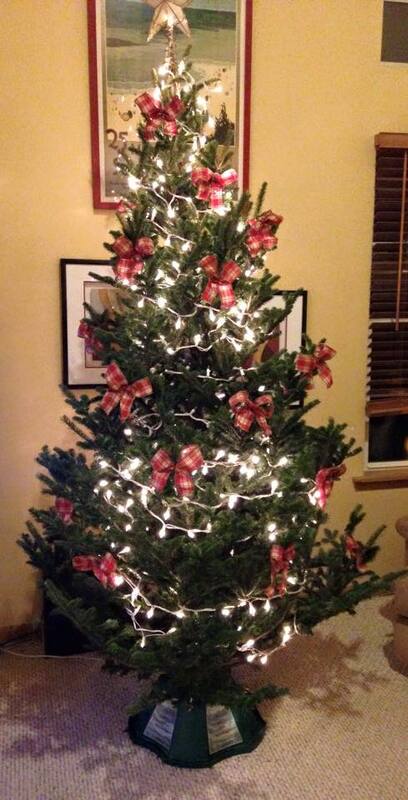 Christmas Night, in fact. I think I’m kind of old for that kind of thing. I mean, I’ve been teaching for 13 years now. It’s been literally years since I had the dream last. I should be over it. Teaching naked. You don’t have to be a psych minor (as I was) to interpret this one. Feeling exposed. Aware of your shortcomings. That everyone can see right through you. That you are a fraud. As a first year teacher, I was terrified that my students would find out I was in my first year. I got hired at my student teaching school, so a few of them knew me from the year before. But I didn’t want anyone to know it was my first time. The kids there had a lot of experience with rookies. Every year the district faced a shortage of 500 or so teachers the week before school opened. A decade after my first year, there are 7 teachers left that I started with. Out of 100. Teaching is a battle of wills. And a battle of generations. Students love to let you know they are smarter than you are. Now I know enough to know I don’t know everything. But back then, any loss in the Kid vs. Grownup arena was fatal. When we moved back to The Region, we ended up living out with the cows and corn. In a city far enough away that it has its own radio station. From a family standpoint, it has been good to us. From a relational standpoint with my students, I feel like I’m better off telling them I’m a Republican. You see, teaching in The HMD is kind of the family business. My mom was a school nurse for 30 years, 28 of them in Hammond. It’s in my soul. I think it shows. But from a kid point of view, they want to know that I’m One Of Them. The big thing with me is, I have never wanted to pretend to be something I’m not. I’m the least cool person I know. And kids can smell fake a mile away. So I’m Just Me. I don’t need to pretend that I grew up how they grew up. But apparently, subconsciously, that’s not good enough. At least if I can believe my dreams. So: Christmas Break. I realized, during my first year, that it is perfectly timed. Still is. This weekend we will all ring in a New Year. 2016. Leap Year. A presidential election. My seniors will graduate. And for me, a complete change of schedule. We are an urban school, trying to do the best for our students and also trying to make sure that that is reflected in our accountability scores with the state. We’ve put a special emphasis on our students who need extra support on our state test this spring, and as such I’ve given up my PLTW classes to teach a full slate of Algebra 1B. Some freshmen, some repeats. I made the move willingly. But still, I’m nervous. Changes are coming. I want my kids to do well. In everything. I want them to learn, first and foremost. I want them to pass my class. And I want them to pass the state test. I’ve been doing this for a while. I’ve learned what doesn’t work, and I’ve found some things that do. But I still feel Not Good Enough. Is it that simple? Is that what stirs my dreams? As someone way smarter than me (Thoreau, I think) said, if you still have dreams, you are still alive. Thing is, with teaching, you can prove yourself year after year after…. and still, every August, and every January, you have to prove yourself all over again. There used to be a family board game called The Game Of Life. Each player had a little plastic station wagon you’d move around a serpentine path, as dictated by the results of a spinner. Graduation, job, marriage, kids (in that order! ), retirement. Get to the end with cash = Millionaire Acres. Broke at the end? Poor Farm. And maybe life is like that. And maybe it isn’t. There’s more than a few think pieces out there on the Meaning Of Life. The game, I mean. I’m a second-career teacher, and a math teacher, and I can state without fear of contradiction: life is not linear. I think sometimes we get way too caught up in making life too much like Life. There’s a baseline, obviously. As a young teacher I once had an expat New York kid tell me proudly that he was going to Yale after he graduated. I told him I thought that was awesome, although I also thought he should pass my Algebra 1 class first. On the flipside, right now, even on the cusp of a world dominated by the Gig Economy, I think it’s a really bad idea to be walking around without a high school diploma. For a lot of my students, the connection between what happens inside my classroom walls and what might happen for them or to them ten years down the road is about as clear as mud. I hope John Mayer is right. It’s just, for some of my kids, I worry that they are counting on a miracle that is unlikely to happen. As a BAM guy, I try to make sure my assessments line up with the material I taught. No gotcha. I want to know: Do you understand what we did the last 18 weeks? Can you prove it? Throughout my teaching career, at two different schools in two urban districts separated by 1800 miles, the process of preparing students for an assessment (chapter or final) has been pretty much the same. Provide students with a study guide, made up of the same problems as the test, substituting different numbers. If problem 1 on the test is solving a one step equation by addition or subtraction, then problem 1 on the study guide is solving a one step equation by addition or subtraction. In addition, most teachers allow students to hand write a page of notes (don’t call it a Cheat Sheet) which they can use on the test. Many teachers even offer extra credit for making the note page. Within the last week I’ve had the same conversation with two different teachers. They told me how they had designed the review process we just discussed up there, walked the students through exactly what they would see on the final, told them exactly what to study, and students still bombed the final. One of my former teaching neighbors (now in a different district) said, “We’re like two steps away from just handing them the answer key.” As grown-ups, and professionals, we look at the situation and wonder what is wrong with our students? We pave the path to the outcome they should want on the final, and still they end up driving into a ditch. What kind of institution have we created? What have we done, when our students would rather walk into my final unprepared, spend 75 hours of their life doing anything but what I’ve designed for them to do in class, stare at some stupid Youtube video or their Instagram feed when all they have to do is focus for a minute to be able to move on to the next square. I mean, if that’s all school was, would you? My dad worked 40 years in a steel mill. My mom was a school nurse for 30 years, most of them in the same district where I now teach. I remember vividly as a kid, my dad (who died of cancer a few weeks before my 22nd birthday) saying “Look at what the mill has done to my body. You don’t want this.” My mom, as a professional and a school employee, just made it clear that not going to college was not an option. For a lot of my students, that’s not a benefit they have. So: just do what the teacher says, ‘cuz you need this credit so you can graduate and go to college and get married and have kids and drive a station wagon and vacation at the Dells and retire. Last week of the semester. 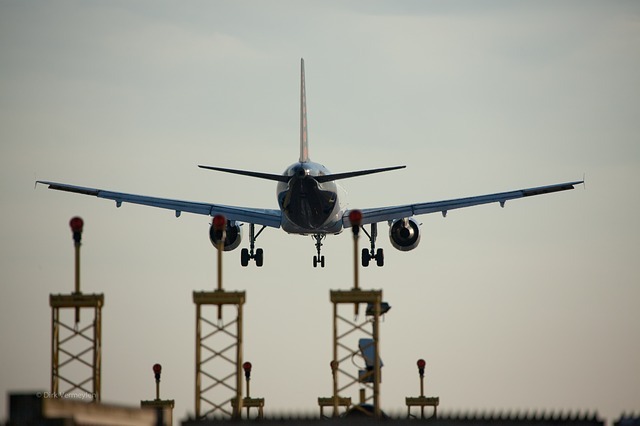 I always feel like I’m a pilot getting ready to set down a jumbo jet after a cross-country flight. And, that I’m not sure if all my passengers are still on the flight. Truthfully, it’s a battle sometimes. I teach kids who hate math and hate school. Algebra is just not on their list of enjoyable pastimes. See, that’s the problem with these kids. You can never get a straight answer. Seriously, tell me how you really feel. Even the students who do play the “game of school” well are a little worn down at this time of the year. At least they are creative about it. I don’t buy “My kids can’t”. I’ll accept “My kids can’t *yet*”. But I’ll tell you for sure, “My kids won’t” is real. There is no downside to “not trying”, with a very real possibility of “trying and still getting an F”. Maybe that’s my problem. I have tried Standards Based Grading in the past, I definitely see the value, but I was never able to get my students to buy in to going back and studying, getting extra help and getting re-assessed on stuff they’d already done. So the icky grade would sit there, and come the last couple of weeks of the term, well, we might as well sit and play Halo all day for a couple of weeks for as much as gets done. One of my biggest challenges each year is to make sure I’m not The Enemy. Each year, during finals review at the end of every term, we take time out of one class to walk through the math to figure out how the final exam will affect their term grade. (Doc here: Final exam score worksheet). And every time, there are students who are stunned to find out they cannot possibly pass the class, even if they ace the test. I tell them I have never been that teacher that roots against his students, who wants them to fail. As much as they want to make me the bad guy, I think most of them recognize that as real. I’ve been Mother Teresa in the classroom. And I’ve been a raving lunatic. I’m back to being very chill. Partially because I don’t want to get snapchatted, but mostly because no 15-year-old needs to get hollered at by a grown-up for not getting math. Or for acting like a fool in class because they don’t get math. 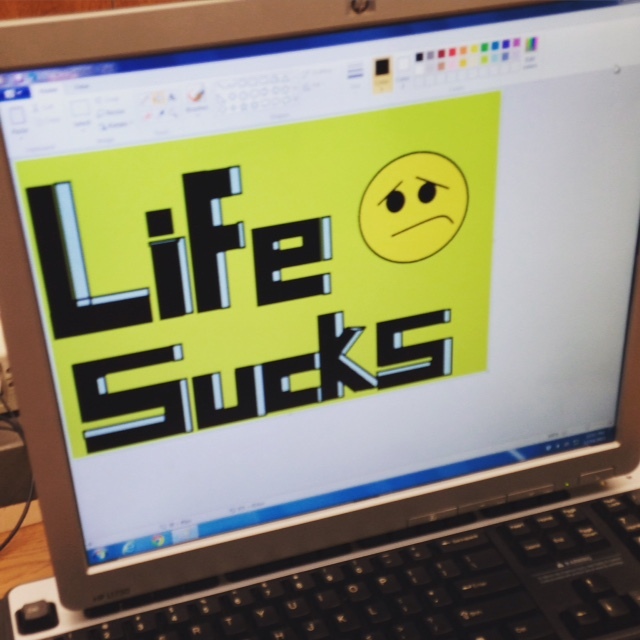 For a lot of my students, life in general isn’t great. My job is: Not To Make It Worse. Mrs. Dull facilitates the middle school youth group at our parish. We alternate between catechetical nights, social nights, and service nights. This weekend the EDGE kids volunteered at a shelter for homeless families, helping to sort and organize Christmas gifts that had been donated through Angel Tree and Secret Santa programs. They also got a tour of the facility’s food pantry, and heard some startling statistics from the Executive Director. Among them: oft-quoted research that places the average age of a homeless person in our county at 9 years old. The kids also found out that all the school districts in the county bus students from the shelter – they are the first to be picked up and then dropped off last so no student will have to be tagged with the stigma of having their classmates see them boarding the bus at the shelter. Here where the magic happens. One of our students sees a classmate’s name on a box of presents. He had no idea the classmate was homeless. He was… stunned. And saddened. His eyes were opened. And his world changed. Even some of the moms who helped out with the service night were shocked and saddened at what they heard. It’s not that they are indifferent to suffering, it’s just that… our brothers and sisters who are hurting the most are often hiding in plain sight. They literally live in a different world, even when that world is the library downtown, or the parking lot at Walmart, or the classroom. What I know for sure is, after Saturday night at the shelter, they can never pretend they didn’t know. And several of them committed on the spot to take action. One girl, a leader in the service club at her school, promised to raise money to buy manual can openers for the shelter families. Because canned goods from the food pantry are great, but worthless if you have no way to open the cans. One Last Thing: many times we are stunned at what our students don’t know – things we take for granted as common sense. Many times it just means that is something they haven’t been exposed to yet. But we rarely think about the things our students *do* know. And you know what? A lot of them know poverty in way I never want to get close to. You know what else? They give from their scarcity. Every time we have a penny war or a jeans day to support a school family who has been hit with tragedy, our kids come through. They dig deep to help. Hell, a few years ago when a severe flood inundated a wealthy neighborhood across the river from our city, it was our students who were among the many folks who volunteered to help clean up. Saturday night, we enlisted a whole new corps in The Resistance. Welcome to the fight. Later that day my youngest and I went downtown to the new outdoor skating rink. Us and about 300 of my closest friends. It’s a popular place, and with good reason. Five bucks to get in, $3 skate rental, and you’re good to go. The line wraps around the lobby, out the door and to the street, people waiting in line to hand over cash. The mayor probably wished he’d have thought of this years ago. I Wanna Drive The Zamboni. So my youngest has never ice skated before. He’s been on roller skates though, so the basics are in place. I’m skating backwards in front of him, to see if he needs a hand keeping his balance. And here it is again: “Show Off!”. I didn’t think so, I thought I was just doing what dads do, but he was pretty stunned to see someone moving backwards on skates. One of the cool things about the rink is it brings out a pretty wide range of customers. Families, dates, groups of friends, aging hockey guys, tweener hockey guys. And Saturday, a sizable group of middle school boys doing what middle school boys do. Which is: show off. Anyways, these guys are zooming around the crowded rink, playing tag, cutting up for the girls. Probably not the smartest plan, but 12-year-olds are not known for great decision-making skills. Probably a miracle no 4-year-old girls got plowed over. So here’s the thing. That term, “show off”, even when used sarcastically, carries at least a begrudging admiration. As in: “I wish I could do that.” As Mrs. Dull puts it, being recognized for excellence is never a bad thing. You could even say it’s an adaptive trait. We are on a quest in my building this year to emphasize the positive and avoid negativity. 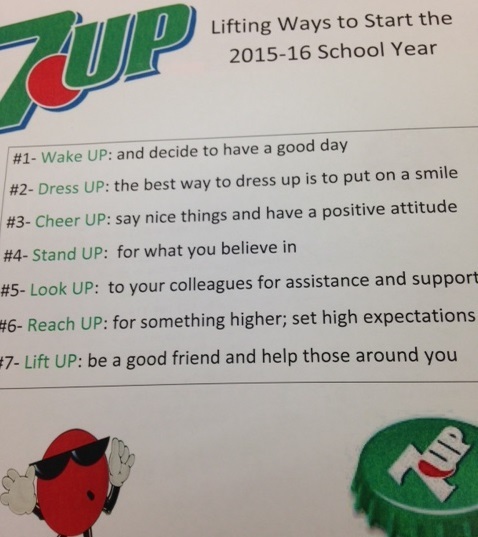 The theme for the year is “7Up”. For a couple of years our school grades had us on the state’s Priority list. Our teachers, administrators, and staff dug in though, were equal to the fight, and last year our combined middle/high school graded out as a C. For the most part, we’ve got 80 teachers pulling in the same direction, collaborating, and sharing ideas. The tech team is there to back up anybody who wants to step out and try a new tool with their students. Departments have a daily collaboration/PLC time separate from their personal plan time. It’s all good. The bigger point of her post is that we have an obligation to all the students in the building to share what works. Not every teacher is open to trying new things, but when that sharing culture is in place, everybody benefits. It’s a two-way street too. The teachers who share tend to find themselves open to receiving great ideas from their colleagues too. Once the faucet is open, it’s tough to shut off. Hey, it’s not showing off if everyone benefits, right? Back before Thanksgiving Break I had built a lesson around Desmos Activity Builder for the first time. It had come highly recommended by my online PLN, and I knew it would represent (potentially) a huge leap in teaching and learning in my Algebra 1A classroom. There was only one problem. I had to know exactly what I wanted my students to be able to do, and create an activity using a specific tool that would lead them there. On purpose. I know the value of intentionally planning a lesson. We’ve all been doing it since Student Teaching, right? Except for a long time that really just meant picking out what example problems I would do, selecting some Guided Practice exercises, and picking evens or odds for the assignment. Not. Good. Enough. Not nearly good enough. Not any more. I had already played around with using the Desmos Online Graphing Calculator to let my students get hands-on with a specific skill. In years past I have had students use it to graph the athletes in one of Dan Meyer’s Three-Act Tasks, “Playing Catch Up“. The questioning and discussing and back-of-the-envelope calculating that took place before the graphing was the big payoff that day though. But now, I had the ability to use a powerful tool to let my students see the math we were doing in ways that really were not possible with pencil and paper, plus it let me collect and see all their work in real time, and to insert questions at key moments of the activity to focus or tease out their thought. It was time to jump in. I took a quick look at one of the sample lessons (“Match My Line” by Michael Fenton) for a reference, closed my eyes, held my nose, and jumped in. 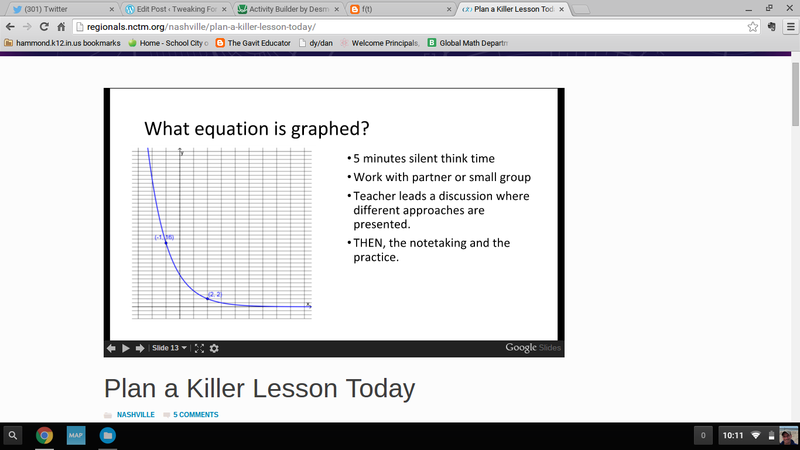 The Desmos folks do a much better job of summarizing the set-up than I can. Long story short: you create individual screens, which could contain a graphing task, a question for your students to answer, or text, such as instructions or congratulations.You can create as many or as few as you need to get the job done, re-arrange them, add screens…. whatever it takes. My simple, 7-screen activity riffed off an activity we had done the previous class meeting, when they had generated a list of pairs of numbers that sum to 6. They plotted the points, and noticed that the points seemed to lie in a straight line. I challenged them to use Desmos to place a line through the points. After letting them flail around for a bit, I gave them a simple equation to try out, and see if they could make adjustments to the parameters to graph the correct line. Evil, I know. 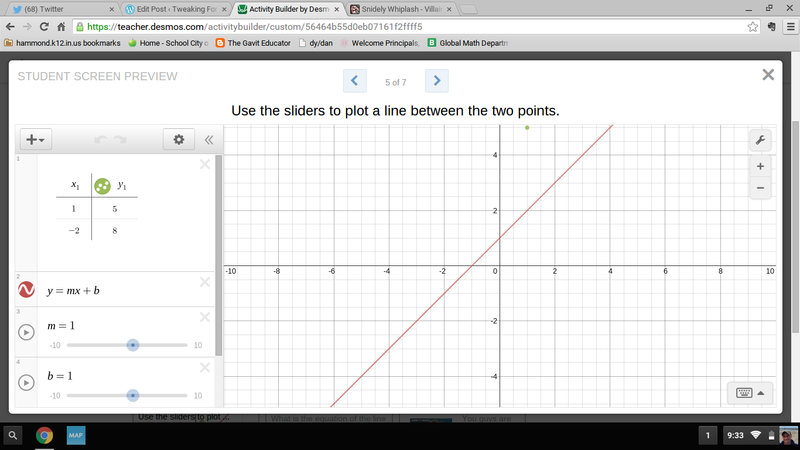 Especially when Desmos features sliders for exactly that purpose. Now at least a few of my students were able to move the line into position by adjusting the slope and y-intercept. My next question: “What is the equation of the line you just plotted using the sliders?” I was banking on many of them recalling from their first or second time through the class they could plug m and b into slope-intercept form and Oh Look! Equation! Alright. Not too bad for my first time. Easy to set up, easy to use. Students enjoyed it. Learning occurred. And if you guessed that I’m thinking to myself: “Self, what other pencil-paper activities of yours could we migrate over to Activity Builder?”, well, you know me so well. Dan Meyer spent some blog space on exactly that topic recently. 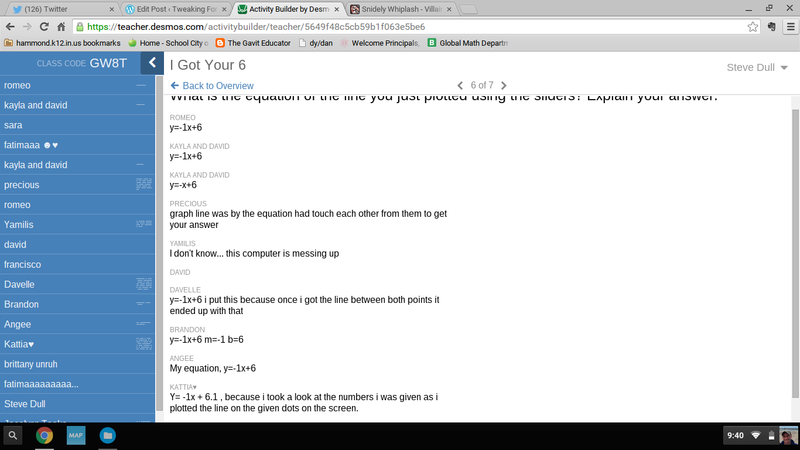 “Desmosify Your Worksheet”… that would make some killer Math Department PD sometime, I think. We are heavy into “I Do – We Do – You Do” in my district. Not that there’s anything wrong with that, in general, just that… there’s a better way. A way that’s more student-centered, both in the burden of work and the person doing the learning. Which is, of course, pretty much the same thing. Kate Nowak presented on the topic at the NCTM Regional Conference in Nashville, and linked to the NCTM page hosting her slides. The shot: “You Do – Y’All Do – We Do” is the preferred order. I’m a convert. A zealot, really. Either way, Activity Builder or Pencil & Paper, I just have to know in advance what I want students to take away, then find a way to nudge them in that direction, ask the right questions, let them rub a couple of brain cells together, then sit back and watch the magic happen. Like a lot of things, it gets more magical with repeated use.